Mary Somerville was a self-taught mathematician and polymath. Today she might be described as a popularizer of science. 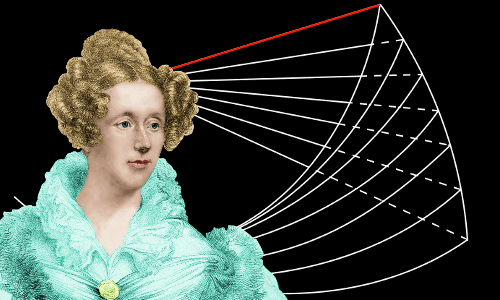 But she was more than a popularizer: her acclaimed translation from French to English of Pierre Laplace’s groundbreaking book on celestial mechanics, with her own additions, became a standard university textbook. Her book On the Connexion of the Physical Sciences became one of the best-selling science books of the nineteenth century, highlighting the underlying unity of scientific disciplines. Mary Fairfax was born on December 26, 1780 in the small town of Jedburgh, Scotland, UK. Somerville was her married surname. Mary’s father, William George Fairfax, had joined the British Navy at age 10. With distinguished service in battle, he eventually rose to the rank of vice-admiral. Mary’s mother was Janet Margaret Charters, daughter of an eminent solicitor. The couple had seven children, three of whom died in infancy. Mary was the second oldest of the survivors. The family moved to the small coastal town of Burntisland, about 9 miles from the city of Edinburgh – 9 miles of tidal river crossed by ferry. The family lived simply, keeping livestock and growing fruit, vegetables, and flowers – Mary’s father was not yet a senior officer and his pay was modest. Despite this, they could afford a cook, maid, and gardener. Mary Fairfax had a carefree, if rather lonely childhood living on the coast. She loved wild birds and would feed them crumbs in winter when there was snow on the ground. Mary learned to read the Bible with her mother’s help, and at age seven began helping with the livestock and vegetables. Her memory for words was poor and she did not enjoy learning the Catechisms – a series of religious questions and answers – for the Church of Scotland. Their minister was a strict Calvinist, and Mary found him too gloomy. When Mary was 10, her father returned from a long voyage to discover that although Mary could read, she could not write. He sent her to a boarding school on the other side of the river in Musselburgh, near Edinburgh. She hated her loss of freedom, and although her fellow pupils were kind to her, she was often tearful with homesickness. She returned home after a year, still unable to write or spell adequately. She spent hours roaming the countryside and beaches observing the wildlife. In the evenings she read Shakespeare. After some lessons with a local teacher she became absorbed in astronomy, observing the night sky, and the northern lights. In 1794, at age 13, Mary received formal school lessons in Edinburgh – she learned arithmetic and how to write properly. She began applying herself more intently to learning. In Burntisland she started teaching herself Latin. For the most part she kept quiet about this – one of her aunts had told her in no uncertain terms to stop reading Shakespeare and spend her time on needlework. However, Mary told her uncle, Thomas Somerville, about her studies. He was delighted and started giving her Latin lessons every day before breakfast. 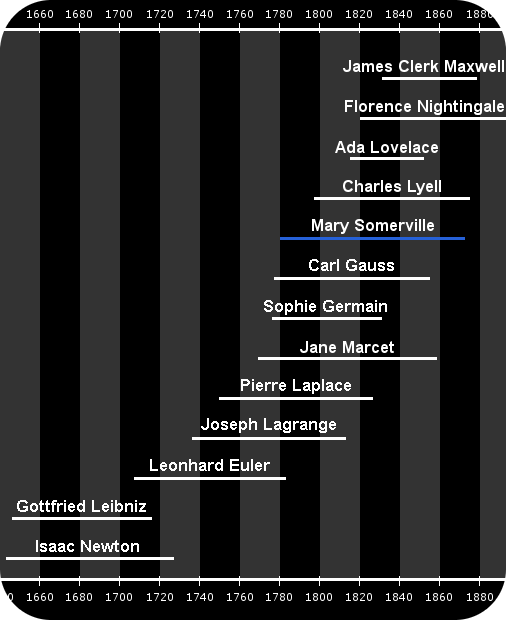 Mary Somerville’s lifetime and the lifetimes of related scientists and mathematicians. A friend of Mary’s mother gave Mary a fashion magazine. On its final page Mary saw a puzzle featuring numbers mixed with letters – her first encounter with algebra. Strangely intrigued, she tried to find out more, but nobody she knew could help. At that time, Mary was teaching herself Greek. She had learned the Ancient Greeks were brilliant at geometry, and the greatest book on the subject was Euclid’s Elements. She asked one of her brother’s tutors to buy her books about algebra and geometry in Edinburgh, which he did. She was pleased to see one of the books was Euclid’s Elements. The removal of candles is reminiscent of Sophie Germain’s experience in Paris in the same era when she tried to learn mathematics. In 1797, when Mary was 17, her family’s social status rose markedly when her father was knighted by the king and promoted to colonel of marines after he served with distinction in a celebrated British naval victory over the Dutch fleet. In 1804, age 23, Mary married her cousin Samuel Greig, the Russian consul for Britain. She moved to his home in London. There she continued studying mathematics independently and also learned French. In 1807, Samuel died. Mary returned to Burntisland with two children. She was financially independent with an inheritance from Samuel. Rising very early each day before her children awoke, she felt ready to tackle “the big one” – Isaac Newton’s Principia. When she returned to Principia, she studied the Jesuit Edition. This version contained notes and comments longer than Newton’s original text, helping her to understand fully the challenging masterpiece second time around. Mary began exchanging mathematics problems and solutions by letter with William Wallace, also self-taught in mathematics. Wallace was editor of a mathematical journal and later became Professor of Mathematics at the University of Edinburgh. In 1811, age 30, she was awarded a silver medal for her solution to a Diophantine mathematical problem. Wallace was a brilliant if relatively unknown mathematician – one of the best in the world at the time. He directed Mary towards the style of mathematics pioneered in continental Europe, which had diverged from the British school. Mathematicians such as Leonhard Euler and Joseph Lagrange had made enormous progress using analysis – a purely algebraic approach to calculus. Lagrange was proud that his great work of 1788, Analytical Mechanics, did not feature a single diagram – it was pure analysis. In 1812, age 31, Mary married her cousin Dr. William Somerville, a medical man, Inspector of the Army Medical Board. William had spent most of his life overseas and was deeply interested in the natural world. On marriage, Mary took the name Mary Fairfax Somerville. In 1814, age 33, Mary told William Wallace she wanted to learn cutting-edge mathematics. Wallace recommended a selection of appropriate books to her. It was fortunate she had learned French, because all the books were in French, authored by mathematicians such as Pierre Laplace, Joseph Lagrange, and Siméon Poisson. Although she was now financially independent, some members of her own family continued to discourage her mathematical studies. Her husband, on the other hand, was fully supportive, and would visit libraries on her behalf to seek out the books and papers his busy wife had requested. In 1819, Mary’s husband began working at London’s Chelsea Hospital and the couple moved to London with their children. Mary continued her mathematics, and in the style Newton, Euler, Lagrange, and Laplace, she applied her mathematics to physical science. She became Ada Lovelace’s tutor and friend. In 1826, age 45, Mary published her first scientific paper in Proceedings of the Royal Society: The magnetic properties of the violet rays of the solar spectrum. …one of the only six persons in England who understands Laplace. The British government, in a desire to advance the cause of mathematics and science, awarded Mary an immediate pension of £200 a year in recognition of the importance of her work. On the Connexion of the Physical Sciences was Mary’s next book. Published in 1834, its 500 pages ran to 10 editions, was translated into French, German, and Italian, and was one of the most popular scientific books of the nineteenth century. Mary shared current developments in modern science with her readers, drawing scientific strands together to highlight an underlying unity of Nature. In 1869, Mary was awarded the Royal Geographical Society’s most prestigious honor – the Victoria Gold Medal – for her work. Mary published her final scientific book Molecular and Microscopic Science in 1869 when she was 88 years old. It took her a decade to write and was composed of two volumes containing 180 illustrations. She covered three major fields: atoms and molecules; plant life; and animal life. 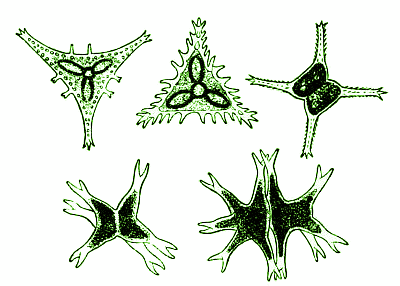 Mary’s drawings of different species of Staurastrum – green algae. In 1842, Mary encountered the unusual situation that the Royal Society would not accept her as a member, because she was a woman, but honored her by placing a marble bust of her in their great Hall. In the nineteenth century, British women did not have the vote. In 1866, John Stuart Mill, the eminent philosopher, organized a petition to Parliament requesting voting rights for women. Mary Somerville’s was one of the 1,521 signatures on the petition. The petition was unsuccessful. In 1819, Sir William Edward Parry named an island in Barrow Strait, Nunavut Somerville Island. In 1879, the University of Oxford opened its first women’s colleges: Somerville Hall, named for Mary, and Lady Margaret Hall. Somerville Hall is now named Somerville College. In 2017, the Royal Bank of Scotland replaced its paper £10 bills with polymer bills featuring Mary Somerville. A Royal Bank of Scotland £10 bill featuring Mary Somerville. In 1804, age 23, Mary married her Russian cousin Samuel Greig. In 1807, Samuel died. The couple had two sons, one of whom died in childhood. The eldest, Woronzow Greig, became a lawyer. In 1812, age 31, Mary married her cousin Dr. William Somerville, a medical man. They had four children, two of whom survived to adulthood: Martha and Mary. Mary and her family moved to Italy in the mid-1830s. Her husband, who was in his sixties, had retired. His doctor advised him to seek a warmer climate for the sake of his health. Moreover, the cost of living was lower in Italy than Britain, meaning their pensions and Mary’s royalties from book sales went further. Mary Fairfax Somerville died peacefully in her sleep, age 91, on November 29 1872 in Naples. She was buried in the city’s English Cemetery. She was survived by Martha and Mary. Her husband, William, died in 1860. "Mary Somerville." Famous Scientists. famousscientists.org. 30 May 2018. Web.